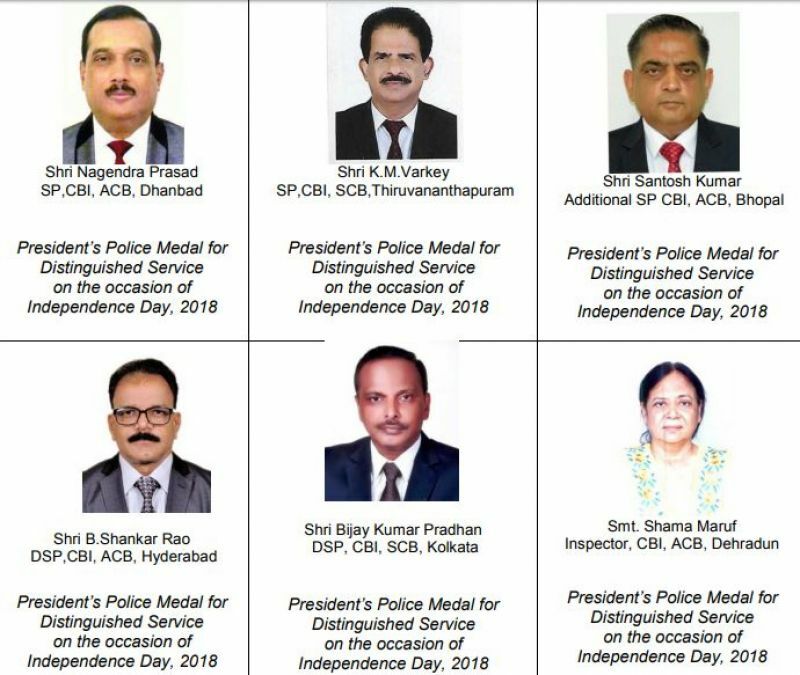 Shri Nagendra Prasad, SP, CBI, ACB, Dhanbad; Shri K.M.Varkey, SP, CBI, SCB, Thiruvananthapuram; Shri Santosh Kumar, Additional SP, CBI, ACB, Bhopal; Shri B.Shankar Rao, DSP, CBI, ACB, Hyderabad; Shri Bijay Kumar Pradhan, DSP, CBI, SCB, Kolkata and Smt. Shama Maruf, Inspector, CBI, ACB, Dehradun. Shri A.T.Duraikumar, SP, CBI, EOW, Chennai; Shri T.Rajah Balaji, SP, CBI, BS&FC, Bangalore; Shri Pramod Kumar Manjhi, SP, CBI, ACB, Bhubaneswar; Shri Sanjay Dubey, DSP, CBI, EO-II, New Delhi; Shri Amit Srivastava, DSP, CBI, SU, New Delhi; Smt. 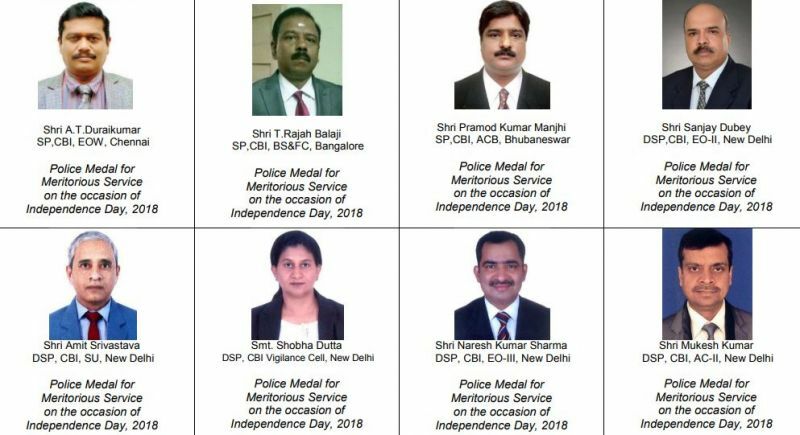 Shobha Dutta, DSP, CBI Vigilance Cell, New Delhi; Shri Naresh Kumar Sharma, DSP, CBI, EO-III, New Delhi; Shri Mukesh Kumar, DSP, CBI, AC-II, New Delhi. 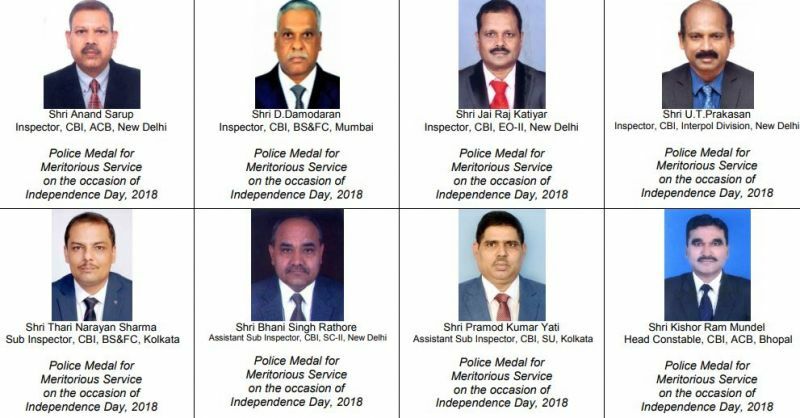 Shri Anand Sarup, Inspector, CBI, ACB, New Delhi; Shri D.Damodaran, Inspector, CBI, BS&FC, Mumbai; Shri Jai Raj Katiyar, Inspector, CBI, EO-II, New Delhi; Shri U.T.Prakasan, Inspector, CBI, Interpol Division, New Delhi.Shri Thari Narayan Sharma, Sub Inspector, CBI, BS&FC, Kolkata; Shri Bhani Singh Rathore, Assistant Sub Inspector, CBI, SC-II, New Delhi; Shri Pramod Kumar Yati, Assistant Sub Inspector, CBI, SU, Kolkata; Shri Kishor Ram Mundel, Head Constable, CBI, ACB, Bhopal; Shri Sathiyan Kuppuswamy, Head Constable, CBI, SU, Chennai. 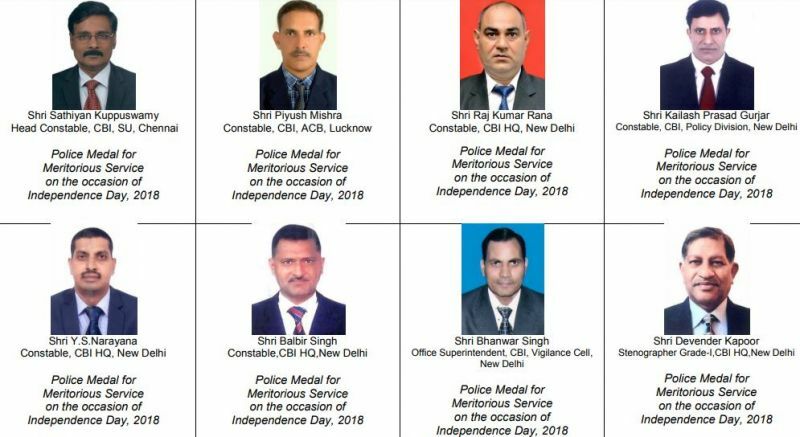 Shri Piyush Mishra, Constable, CBI, ACB, Lucknow; Shri Raj Kumar Rana, Constable, CBI HQ, New Delhi; Shri Kailash Prasad Gurjar, Constable, CBI, Policy Division, New Delhi; Shri Y.S.Narayana, Constable, CBI HQ, New Delhi; Shri Balbir Singh, Constable, CBI HQ, New Delhi; Shri Bhanwar Singh, Office Superintendent, CBI, Vigilance Cell, New Delhi and Shri Devender Kapoor, Stenographer Grade-I, CBI HQ, New Delhi.